I studied acting in school and have a graduate degree, so I spent at least seven years studying the craft of acting, three of them very intensively. I also worked as a stage actor for many years. When I got married, I knew that the demanding schedule of the theatre would be difficult as a mom. At my wedding, a good friend said she’d met someone in Seattle that recorded audiobooks. As an avid book lover, I thought, “Getting paid to read books? That’s for me!” This person in Seattle was none other than Kate Fleming, who recorded as Anna Fields, a much beloved narrator who died tragically in 2006. Long before that, however, in 1998, she generously spent some time on the phone with me to give me some inside info on the business. I was in Los Angeles then, and I was able to wrangle myself some work editing tape of celebrities recording abridged books for Dove Audio. When my boss left Dove to open an LA studio for Books-on-Tape, he hired me to be his Gal Friday and I spent a year helping him run that studio: editing, casting, directing and narrating. 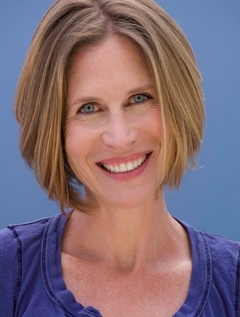 After my first child was born, I decided to be primarily a stay-at-home mom but I was able to continue freelancing as a director and narrator and proofer. Sixteen years later, I am narrating full time from my own custom-built home studio (with time allotted to play chauffeur for my teen girls). Do you go to a studio, and is there a director and audio people running the machinery? When I first started out, I always went to the studio to record, and we had a director run the sessions and an engineer who would take care of the equipment settings. I am lucky to have a sound engineer for a husband (he records film and TV shows, but a lot of the equipment is the same) and he has set up all my studios. I’m glad I had years of experience working with a director before I set out on my own, but now I love the flexibility working at home gives me. It does get a bit lonely, however, and I do end up talking to my dogs a lot during the day (one thing I have in common with Olivia Limoges!). Have you ever narrated a book you didn’t particularly like? Do you only pick books to narrate that are a genre you already like and read? Do you enjoy the books you “read”? What I love about this work is the variety of books that I record, and that I end up learning about subjects I never might have otherwise. When I read books for pleasure, I tend to choose books that I can get lost in – mostly women’s stories, I guess, and historical fiction. But I’ve been assigned books on all kinds of topics (Myanmar, pain, economics, dogs, nuclear energy, happiness and death to name a few!) and I love being stretched like that. Although I probably wouldn’t have chosen to read the majority of books that I record, it’s my job to find a way to connect with each one. How do you connect with each character, theme and the emotions? Do you get to really follow the books you read, or do you feel you need to read them again to know what the book is about? And Laura and Nancy asked if I read the book first. Yes! It is really important to me to be able to read the entire book first. I have heard that some narrators don’t do this, but I could not do my best work without reading through, highlighting all the character information as well as words I don’t know how to pronounce (see Ellery’s answers on getting help from the author on pronunciation research) and then taking assiduous notes. Studying the book in this way allows me to understand the tone of the book and it’s overall story arc, as well as each important character’s journey. Once I’ve done that research and have it at my fingertips, I can play my way through performing the story, relying on my actor training and instincts as I go. Do you vary your voices distinctly/dramatically? Meaning is it obvious to tell which character is speaking? How do you create that “voice”? The best readers slightly change the tone of the voice as they switch characters. How hard was it to learn to do that? When I started recording audiobooks, the style was more distant and formal. 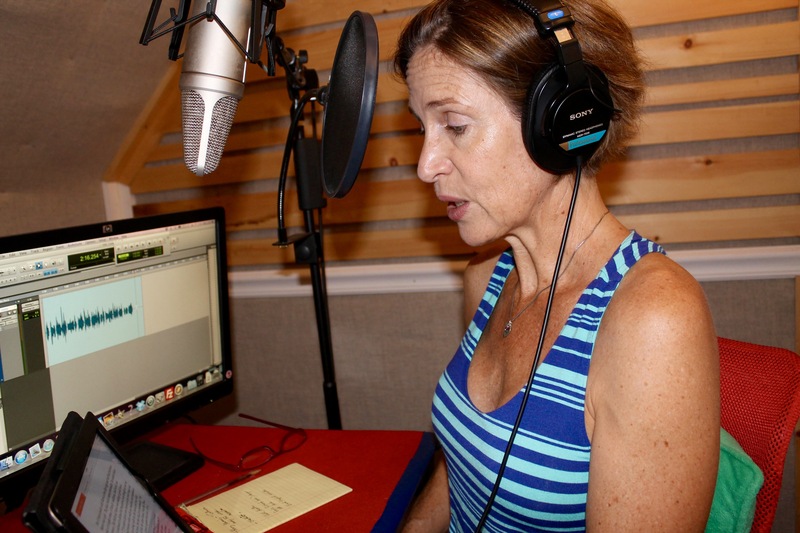 These days, listeners want more of a one-woman show. The cozy mystery genre is especially fun in this more theatrical style because these books are often filled with really distinctive and fun characters. Using my preparation, I do my best to create a different voice for each character based on information the author has included. For instance, Olivia Limoges was born in Oyster Bay but was whisked away to the finest boarding schools by her wealthy grandmother at a young age, so her voice is cultured and reflects her education and status. Laurel’s voice is described as “high and melodious” and she “giggles a lot” and we are often reminded that she’s a former cheerleader, so that influenced the voice I found for her. Millay has a “husky, melodious voice” and she works in a smoky bar much of the time. So she’s got a throaty voice with a lot of snark to fit her general attitude. And there are many, many others in the series! I keep sound files of them all to keep them straight, though the main characters have evolved and become more complex as I get to know them. Hopefully, this all works for the listener. Not including all the prep time, it takes me, on average 2.5 hours of time in the studio to record a finished hour. So for a nine-hour book, that’s 22.5 hours in the studio. That does NOT include breaks to make more herb tea or let the dogs out. And realistically, my brain and voice can only spend about five hours a day recording. The rest of my workday is spent doing prep, and of course, keeping my business going by interacting with fans and authors on social media and doing fun interviews like this one ;). 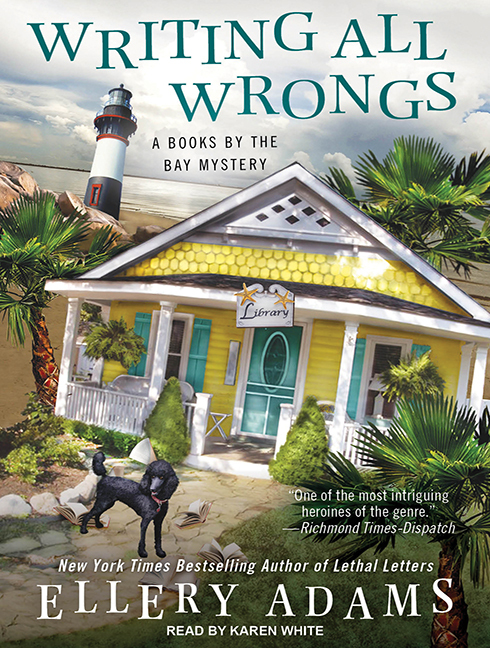 Ellery Adams’ Writing All Wrongs, book 7 in the Books by the Bay Mystery series, narrated by Karen White is now available on audio.